The offices of today have different types of filing cabinets but they are all stationary. This makes these cabinets difficult to move and once installed, they cannot be relocated. Rolling file cabinets are a recent development in the filing family. They can house paperwork and other essentials in a neat way without consuming a lot of space. No matter how convenient you find stationary cabinets, there are numerous advantages to rolling cabinets. Why go for rolling file cabinets? The reason these cabinets are a better alternative to the stationary cabinets is because most workspaces are located around the office. Thus, one needs a filing system which is accessible even when one is working far from their cubicles. 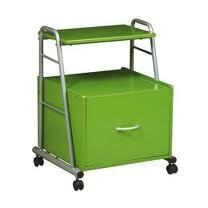 While a stationary cabinet has limits with mobile accessibility, the rolling file cabinets make work easier. There are numerous examples to quote the utility of rolling file cabinets. You may move the cabinet next to the printer or copier machine for immediate filing purposes. You can take the cabinet with you inside meetings with all the documents stashed away neatly. The easy convenience and comfort makes these cabinets very handy. The rolling file cabinets have one significant disadvantage. They do not have a large storage capacity to house huge volumes of data. They also are less safe as they are mobile. The size is smaller as these cabinets have to be mobile but also, one has to take care that the cabinet does not tip over when it is moving. How to choose a cabinet? If you are considering buying a rolling cabinet, evaluate the quality of the materials and the designs used to cast the cabinet. Although rolling cabinets offer mobility and ease of work, some designs offer efficient filing and more durability than others. All these points must be taken into account before finalizing your furniture piece. The design for the cabinet you are buying must be sturdy. Unlike the traditional stationary cabinets, the rolling file cabinets must be able to preserve their structural identity as they are transported away in different corners of office. Thus, the pillars and side walls of the cabinets must be strong and effectively fastened on to a larger frame. Without this design, the portable models will break down over time and can even fall apart. You must also inspect to see that the drawers open completely and do not get obstructed while pulling in or out. Additional features of security like locks and counterbalances can also be taken into consideration. Make it a point to look for the rails and holders inside the cabinet for any damage before buying. Mismatched or poor handling systems can compromise on your data security. Where to buy rolling cabinets? Almost all home shop stores feature rolling cabinets. You can also look for these online or if you are planning on buying a second hand cabinet, you may head towards the local thrift shops.